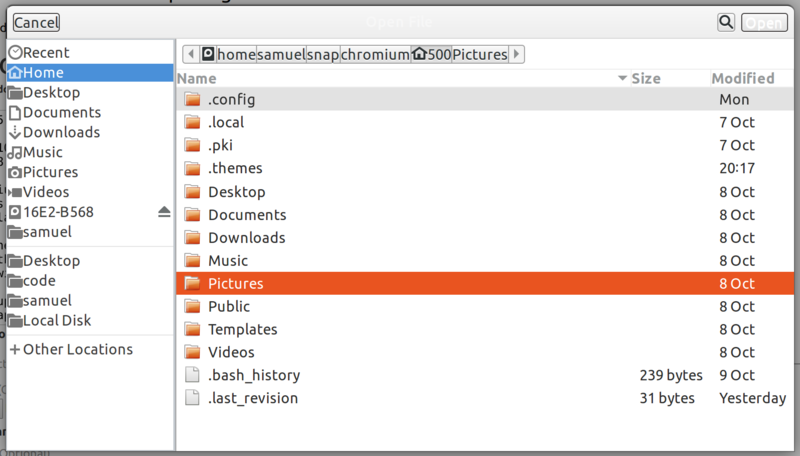 The file picker should use the user's home folder, not the snap's, because everything else would be confusing for end users. This also affects the libreoffice snap, and more generally all snaps using the desktop helpers (and it should be fixed there). And I filed https://github.com/ubuntu/snapcraft-desktop-helpers/issues/167 to track the issue where it belongs. I don't think we want (or can) change HOME in snapd (due to undesired consequences and breaking many snaps), it works as designed, i.e. gives snaps dedicated areas where they can freely write data to, including hidden files; access to real user $HOME may not even be allowed unless home interface is connected. I see an alternative approach that only affects file picker is already discussed in the snapcraft-desktop-helpers issue above, for now marking it invalid for snapd.